hi-pc has no other items for sale. There are 698 items available. Please enter a number less than or equal to 698. Item exactly as described. Great service. Early arrival.. Great timing. Had time to program it today. Arrived safely and on time. Thanks. This radio was purchased to be able to monitor weather and any emergency signals around my area. I live in the country and my Radio shack scanner was no good picking up signals. Also couldn't get my favourite FM station with anything short of my stereo. This little Baofeng radio picks up signals anywhere around here and even grabs my favourite FM channel with the longer antenna. The radio takes a little understanding to program but was figured out easily by just using common sense. However for the seasoned ham operator there should be no trouble. Very impressed. If they only made a digital model that could receive the new digital police, fire, and emergency bands. I would get one in a minute. This model however only cover the older systems. However for a beginner or for a toss around "Beater" radio, this is perfect! I recommend this to everyone. I would rate 5 stars.... Only reason I didn't was because of the programming. The book needs to be more explanatory on some of the settings so a beginner can understand it more without looking things up on the web to see what they are. Make the book more informative and an easy 5 stars! Hello everyone I purchased 2 radios. One has low and intermittent transmit power. The website does not allow access for returns. The company was also unwilling to accept RMA (return) without giving a 5 star review. In the U.S. That is considered blackmail and extortion. The radios are not a high cost itemi would rather keep them than change my review. WELL MADE PRODUCT. VERY HAPPY! I get good signal reports on the local WINsystem repeater. The microphone which you can buy as accessory is good if modified. The Nagoya long antenna is also a big upgrade. Wish it had the BAND button, like the UV-5R, even though it was redundant. Battery holds up for a long time. 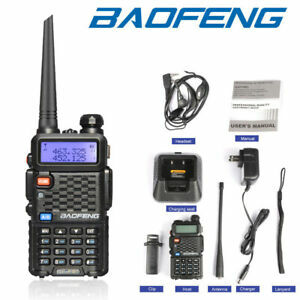 This is the second BF-F8HP I have purchased from Baofeng Tech. I am very impressed with the radio and the technical support. I paid Baofeng Tech more money than others charge but The others come from China and take months to receive, if you receive it at all. This unit not only works 2 meters and the 440 band but works as a scanner as well and receives FM radio stations as well.